Excerpt from Special Message to the Congress on Urgent National Needs. May 25, 1961. President John Kennedy, I believe that this nation should commit itself to achieving the goal, before this decade is out, of landing a man on the moon and returning him safely to the earth. FABULOUS montage of NASA engineers testing and constructing equipment for Apollo program (includes great color shots of a man using a rocket jet pack): splashdowns, capsules being dragged in water, weightlessness simulation. POV looking at surface of the moon from window of lunar module. GV pan of surface of moon with still American flag planted. 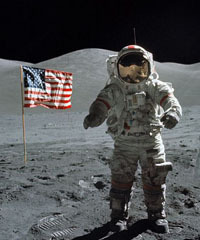 GV Neil Armstrong on surface of moon in front of the American flag. POV surface of moon from lunar module as it pulls away from the surface. Nice POV out window of the 'Eagle' Lunar Module as it lands in the Sea of Tranquility on the moon's surface. GV as astronaut climbs down outside of lunar module to moon surface, the lunar module casts a large dark shadow on the moon's surface. CU surface of the moon, pan out to GV of lunar module orbiting the moon. CU profiles of astronaut Michael Collins shaving while in space. Master 1808 - Tape 1 LS large satellite dish in desert. TLS satellite dish in green valley. TLS shining sun high overhead, flares on glass. Second broadcast from space (audio of communications between mission control & astronauts over TV satellite images of planet earth). MS Apollo VIII astronauts working in command module, zero-gravity. TLS/MS/CUs mission control working, manning computer consoles, using communication headsets; audio of permission for lunar orbit insertion is given. Aerial of moon, lunar surface. More shots of mission control working, some rather nervously drinking coffee & smoking cigarettes while waiting for re-establishment of communication with Apollo 8 while passing behind the moon. Master 1808 - Tape 1 FO/FI CU NASA seal. FO/FI LSs Saturn V rocket on gantry, dawn. Tilting TLS Saturn V rocket against blue sky. TLS bustling mission control room; rear view MS white men manning consoles. LS rocket on gantry, preparing for blastoff; MS afterburners firing up; LS rocket blastoff w/ audio of mission control. LS Saturn rocket sailing into space. Excellent rear view MSs first & second stage rocket separations in earth orbit, earth horizon in BG. CU/MSs mission control working, communicating w/ Apollo VIII astronauts; includes CU Apollo XI astronaut MICHAEL COLLINS glowering, using headset. Nice jittery, tight-frame views of earth from space. TLS flight path map in mission control. More shots mission control, audio of TLI (Trans-Lunar Insertion) clearance being given. Opening credits. MS/CUs mission control room workers-- including Apollo XI astronauts MICHAEL COLLINS & NEIL ARMSTRONG -- working, manning consoles, communicating via headsets, viewing computer readouts. Color illustration of Apollo VIII capsule orbiting earth. Master 1808 - Tape 1 MS Apollo 8 astronauts working in zero-g. MSs mission control employees working, conferring. MS Apollo 8 astronaut JAMES A. LOVELL JR working in module, zero-g. MSs mission control manning computer consoles. TV satellite feed of Apollo VIII astronauts working in space (first broadcast). Master 1808 - Tape 2 MS Apollo VIII astronaut JAMES LOVELL working in capsule, zero-g (note the small flashlight floating & spinning about). MS/CUs mission control working at computer & electronic consoles, communicating with headsets; audio, "All systems are go, Apollo 8." MS/CUs mission control waiting, talking nervously for re-establishment of communication w/ Apollo 8 crew; nice CU Apollo VI astronaut MICHAEL COLLINS waiting apprehensively; CU flashing lights on console board; audio of communication lapse & re-establishment; MSs workers writing in notebooks at consoles. MS Apollo VIII astronauts working in zero-g; audio of funny communication w. Houston-- "I told Michael you guys were up there & he said, Who's driving?" "That's a good question. I think Isaac Newton's doing most of the driving right now." MS Christmas tree in mission control. MS/CU mission control worker eating hamburger at console; MS worker filling coffee cup at silver decanter; CU worker eating potato chips at console; funny audio of astronauts describing their X-mas dinner ( a "delicious" TV dinner of turkey & gravy), mission control stating they're having "cold coffee & baloney sandwiches." MS Apollo VIII astronaut JAMES LOVELL working aboard capsule, zero-g. MS/CUs mission control working, manning consoles, using headset communications; audio of communications between Apollo 8 & Houston, speaking of "relaxed vigilance." TV feed of planet earth as viewed from space; audio of Apollo VIII astronaut looking forward to coming home. More shots of mission control working. Master 1808 - Tape 2 Animation of Apollo VIII capsule separation & reentry into earth's atmosphere. Tracking film of Apollo 8 re-entering, films of re-entry burn as viewed from capsule. MS/CUs mission control waiting breathlessly, anxiously for communication w/ Apollo 8; one man breathes high sigh of relief upon success. MS Apollo VIII astronauts FRANK BORMAN, WILLIAM ANDERS & JAMES LOVELL stepping from U.S. Navy helicopter aboard U.S.S. Yorktown, smiling & waving. TV feed on console of Apollo 8 astronauts alighting copter. MS small American flags being distributed in mission control. TLSs large U.S. flag being rolled out in mission control, men standing & applauding. MSs mission control shaking hands, smiling, lighting & smoking cigars, planting & passing American flags (patriotism, nationalism); MS Apollo XI astronaut MICHAEL COLLINS smoking cigar in mission control; everybody lights & smokes a celebratory cigar. Audio excerpt of Apollo VIII Christmas Eve broadcast from the moon, reading of Book of Genesis from Old Testament over imagery of sunrise on the moon: (William Anders) In the beginning God created the heaven and the earth. And the earth was without form, and void; and darkness was upon the face of the deep. And the Spirit of God moved upon the face of the waters. And God said, Let there be light: and there was light. And God saw the light, that it was good: and God divided the light from the darkness." Traveling aerial of the lunar surface over audio of James Lovell speaking: "The vast loneliness is awe-inspiring and it makes you realize just what you have back there on Earth." Master 1808 - Tape 1 Excellent jittery tight-frame aerials of pock-marked lunar surface as viewed from orbiting Apollo 8 module; audio of Apollo VIII astronauts relaying impressions of moon surface to mission control-- James Lovell says, "The moon is essentially gray. No color. Looks like plaster of paris. Sort of like grayish beach sand." Nice cutaway MS TV feed image of moon as viewed on monitor of mission control console. William Anders says, "The color of the moon is a whitish gray, like dirty beach sand w/ lots of footprints in it." "There's some craters & buildup that definitely suggests volcanic activity." Master 1808 - Tape 2 Excerpt of Christmas Eve Broadcast: audio of broadcast from Apollo VIII to mission control over aerial of moon horizon; "Welcome from the moon, Houston. The moon is a different thing to each one of us. I know my own impression is that it is a vast, lonely, forbidding type of existence. An expanse of nothing. It looks rather like clouds & clouds of pumice stone." "And from the crew of Apollo VIII, we close w/ good night, good luck, Merry Christmas, and God bless all of you, all of you on the good earth." Traveling over moon's surface as seen from the Lunar Module 'Eagle). Shot of shadow of the Lunar Module being cast on the surface of the moon. Tilted shot of the moon's surface. TLS activity at mission control at the Kennedy Space Center. TLS mission control watching lift off from control room. 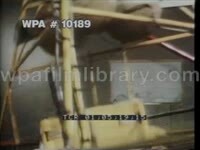 High angle slow motion TLS Apollo 11 lift off. MS/TLS activity at mission control Houston. MS gauges and dials, pan to window to see satellite dish outside. TLS Neil Armstrong climbing down the Lunar Module to the surface of the moon, the eagle's shadow is cast on the surface. TLS mission control. TLS Armstrong making his way to the moon's surface. MS chart at mission control. TLS Armstrong hopping about on the moon's surface. TLS Buzz Aldrin climbing down to the moon's surface. Several TLS/LS of Apollo 12 on launch pad. Interior TLSs of Apollo 13 in production. Several MS/TLS astronauts training with simulators. Several shots of Lunar Rover Vehicles being tested at the Marshall Space Flight Center in Huntsville, Alabama. Several shots of engineers testing multi-engine Saturn vehicles at Huntsville. Several shots of Marshall's Saturn V rocket. Illustrations of a concept space station. Aerial shot of U.S. Navy frogman leaping into ocean from helicopter to recover Apollo XI space capsule & astronauts; aerial shots of successful recovery mission; nice high angle MS astronaut being lifted to copter via cage; TLS Apollo XI astronauts aboard USS Hornet, waving while walking to decontamination chamber; CU Buzz Aldrin smiling; MS Neil Armstrong smiling, talking on red telephone; CU Michael Collins sporting thin moustache, nodding & smiling while talking on red phone. Apollo 12: MSs Apollo XII astronauts CHARLES CONRAD JR, ALAN BEAN, and RICHARD GORDON laughing, smiling, posing in space suits; great traveling aerial shots of pock-marked lunar surface; sideview MS Apollo 12 astronauts working in space; high angle TLS astronaut descending steps of lunar module, walking on moon. Moon missions, lunar missions, aeronautics, space exploration, NASA. MSs/MCUs astronauts in training. CU astronaut JIM LOVELL in space suit. VO gives details of each astronaut. CU FRED HAISE. CU JACK SWIGERT. CU KEN MATTINGLY. MSs mission control. TLS launch. MS board monitor in mission control.